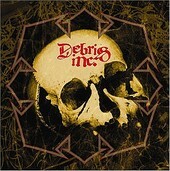 In Music We Trust - Debris Inc.: Debris Inc. When members of seminal metal outfits Trouble and St. Vitus join forces in a project, what's a listener to expect? Debris Inc. answer that burning question with the sheer sonic force and a huge retro sound that actually sounds more punk than you'd expect purveyors and pioneers of the doom metal scene to sound like. On this 17-track opus, Dave Chandler (St. Vitus), Ron Holzner (Trouble), and a rotating array of drummers (including Jimmy Bower of Down/Eyehategod) turn the clock back a bit and pound out some lo-fi, drunk and stoned crossover punk a la DRI, DOA, and Black Flag. But fear not, there's doom aplenty here, as the creeping "The Old Man and His Bong", the slow churn of "Pain", and "The Life and Time of Claude and Elmo" relive the glory days of doom, but not before Debris Inc. bitchslap you with the unsanitized sounds that punk used to make in the forms of songs like "Shut Up" and the Fear cover "I Love Living in the City". If you remember any of these guy's past works or have heard of their legacy, this CD worth the listen.